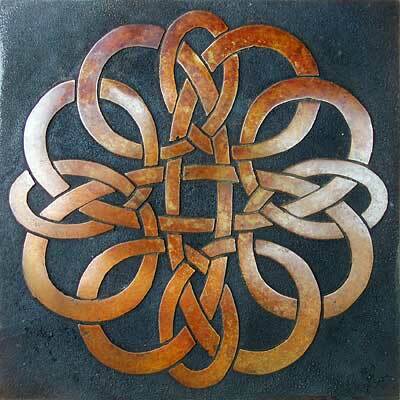 This Celtic knot sort of just happened one day. I was doodling and somehow I got into it and a few hours later I had the basic design, and I liked it, but then I noticed that there were a couple of sets of crossed hearts that weren't apparent at first. Then came the real work of making this basic design refined enough to work as a tile and that took a couple of months. It seemed to just not really work, either one line was too fat or too thin, or an intersection wasn't balanced or tight enough, but, obviously, eventually I arrived at what I was trying to get at. From there it was a matter of working up a model and then making the mold and casting the waxes that became the first few bronze tiles with this design on them. What you see above is the first Artist's Proof, fully finished in the top picture and ready for the final patina in the lower picture. This knot is actually a pair of knots, with two strands, which fits the whole concept of love, having a male and female part intertwined with each other for eternity. 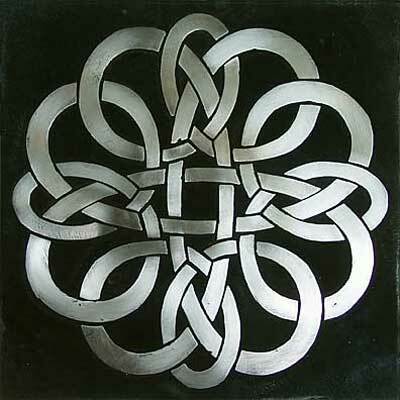 Their centers cross and there is also the main cross that ties them all together. Of course, this is how it looks to me, and you may see this differently, or not see the hearts at all. I sure didn't at first. I did like the basic flow of it all and I hope you do as well. For further information concerning your particular application please refer to the information on the Bronze Tiles page to see if this answers your questions, and if not, please feel free to email me at michael@enchantedcreek.com. Special orders and commissioned work are more than welcome.